Fudd is designed to be used in conjunction with 3DS Max and Adjutant. 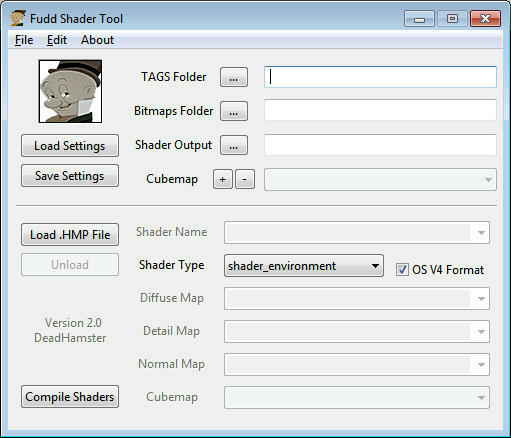 After exporting a BSP or Object Model and importing into 3DS Max, Fudd can be used to automatically compile shaders corresponding to the proper diffuse bitmaps, detail maps and normal maps extracted with Adjutant. To do this, all the bitmaps must be compiled into a single folder. This includes the normal and detail bitmaps. Fudd Version 2.0 can compile to either stock or OSv4 formatted tags. It compiles to either the shader_environment or shader_model tag class. Your settings can be saved, including multiple cubemaps. When opening a HMP all shaders default to the current settings. After loading, each individual shader can be modified to change which cubemap is used, change if it exports to OSv4 or stock format, and change which tag class it exports to. xHMP is an accompanying MaxScript. xHMP reads the model and exports all the bitmap data in a format that Fudd can read. To do this, the user must first link the model to proper frames as though they were going to export to a JMS file. The new update to xHMP loads all materials before exporting. It will list how many materials, as well as how many diffuse, detail and normal maps were loaded. xHMP will not export any shader that does not have a diffuse map, and will not export +sky materials. Ragtime Gal takes compiled .MAP or .YELO cache files and renames all the tags within it. This allows a user to extract the tags with Refinery and preserve the tags' references to one another. This program also has features that organize a tag based on it's tag class, deprotect tag names and place tags in subdirectories for organization. By selecting Organize, which is enabled by default, all tags are placed into directories based on their tag class. This allows a user to take an unorganized tags folder and break it into a simplified system for extraction to a project folder. Years of tags downloaded from sources can be combined and organized with minimal effort. And the program has a Chart menu that allows the user to edit the directories that the tag classes are organized to, allowing for maximum customization and organization. The 3.2 update includes a new Sound Override mode. Rather, it includes a Not-Renaming-External-Sounds mode which must be overridden. Any sounds tag stored in an external resource map can only be referenced by their name, so by renaming the tags inside the map file they can no longer be found by Refinery or other extraction tools. If a user wishes to use the override mode, they will have to find a different way to rename the tagnames in the external resource maps. This feature is currently not supported by Ragtime Gal. While this may seem like a setback, it actually means that Ragtime Gal is now fully functioning as best as can be, without any known errors. I've also updated the .frog files to support some of the most common OSv4 tag formats, and fixed errors with some stock tag classes not being recognized, so less tags will be classified as unknown. Time: Tue April 23, 2019 11:13 PM 125 ms.